This is a fun technique I learned this summer. I saw a necklace that used this technique at The Bead Monkey and then found this excellent tutorial video online. So if you want a video version of this, click that link! If you prefer photos and text, read on! The Basic Idea: Each cage is made with 4 jump rings which are joined to make sort of a tiny box for a 'captured' bead, which is not connected to anything. The hardest part is finding the right size jump rings so that they fit around the bead, but are not so loose that the bead falls out. I used 8mm beads and 11.5mm jump rings, and they were just a hair larger than I would have liked. They worked well as long as the jump rings were perfectly tightened, but if they were loose at all the beads sometimes slipped out. Of course you can experiment with different types of beads and different color jump rings to get a wide variety of results! 1) Start with two small connecting jump rings. 4) Hold the small jump rings together, and let the large jump rings fall open, sort of like flower petals. 6) Close rings over bead. The lower 'A' rings will be close together at the bottom then spread apart. The top 'B' rings will be spread apart then come together over the top of the bead. 7) Thread two new 'A' jump rings through the top of both 'B' rings, one on either side of the bead. Notice how the new 'A' rings sit INSIDE the ends of the previous 'A' rings. Add you next 'B' rings and continue! 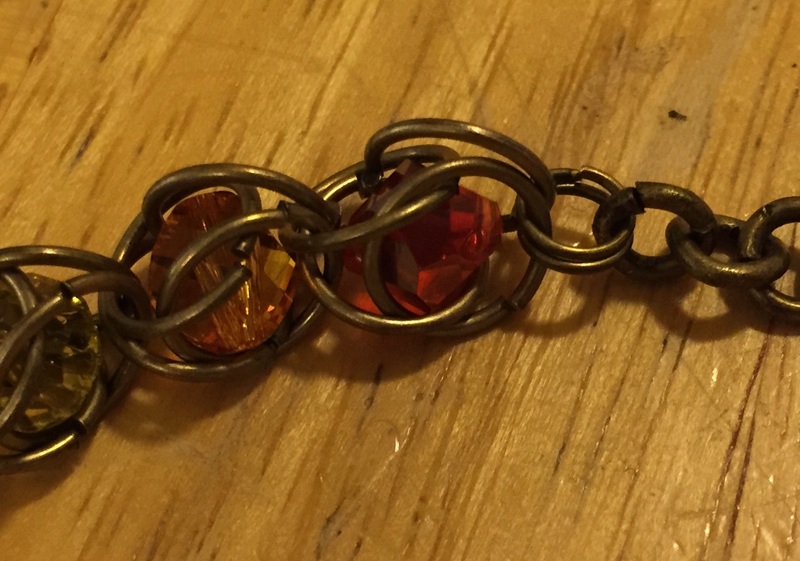 As I mentioned before, the hardest part is finding jump rings and beads that are 'just right' sizes for each other. If the bead is falling out easily you need a larger bead or a smaller jump ring. In general it seems that the jump rings should be just a little larger than the beads. Thicker jump rings will need smaller beads. If you know a formula for determining bead/jump ring size please let me know! 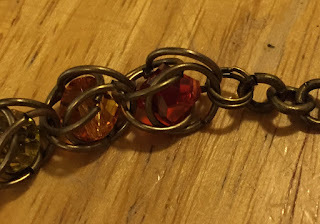 If you make the entire necklace and everything seems to be going well then suddenly one of the beads falls out it may be that those jump rings weren't quite tight enough. Sometimes I will over-tighten jump rings if a bead keeps falling out and I don't want to get a larger bead.